There has been so much in the press over the last few years about how our native bee and butterfly populations have declined so dramatically – a five-year study that came out last spring showed that the bee population has declined by 50 per cent in the last 50 years, while our native butterflies are down by more than 70 per cent. Whilst there are, it would seem, a number of contributory factors, for bees the main problem is the use of insecticides on crops and a mite called varroa, which causes a virus that can wipe out a whole bee colony. The factor that is known to affect both bees and butterflies is a lack of flower-rich habitats, as the countryside around us turns into larger farms with single crops that all flower at the same time and create a monoculture, instead of the biodiversity we need for insects. So here is my idea. As we know, our gardens can play a vital part in balancing out this trend; they also provide an important link between countryside habitats, acting like a flower corridor for insects. Our response can be to help create the right flowering habitats in our own gardens, which can become a feeding haven for all our native insects. With well-thought-out planted borders in even the smallest garden, you could hope to attract up to 18 species of butterfly and any number of bees from the 250 species known in the UK. The first factor is to choose a warm site that’s sheltered from strong winds and gets as much sun as possible. I have chosen a large border at the back of a raised area of my garden, which is probably the sunniest spot I have. Last year I removed some large evergreen shrubs – although some shrubs are good for insects (especially Buddleia, aptly known as the butterfly bush), I wanted the space to include as many flowering plants as possible throughout the seasons, so creating biodiversity in my own plot. For the structure I chose some large grasses and then interplanted with lots of perennials and herbs specifically to attract the pollinators. The spring is an important time for any insects coming out of hibernation so early spring flowering plants are very good news for them – examples are crocuses and forget-me-nots, and the perennial wallflower Cheiranthus (to give it the Latin name; the common one is Bowles Mauve). This will flower nearly all summer, especially if you cut back the flowers once they have finished in order to get a second flowering. This is good practice for any flowering perennials in your bee border, deadheading after they have flowered giving them a second flush of flowers and so prolonging the nectar for the pollinating insects. Spring bulbs like tulips and alliums are also a good food source. Plant them in drifts throughout the border; they look fabulous too. Flowers close to our native species, like the large bugle or Ajuga ‘Catlins Giant’, always seem to be covered with bees in my garden. Then in mid-season, go for lots of flowering perennials and herbs – lavender is an obvious choice as it is known for attracting bees. Hyssop and the bergamot flower Monarda will also get plenty of action. The large thistle-like flowers of Echinops and the pale yellow flowers of Cephalaria gigantea will need staking and planting at the back of the border but are both stunning to look at and very attractive to all the pollinating insects. For nearer the front of the border the perennial cornflower (Centurea montana) is also ideal and easy to grow, and flowers from May to July. To bridge the gap between early summer and late summer perennials, fill any spaces with annual seed. I’ve added cornflower, night-scented stock (which is also excellent for moths) and the California poppy. As you may have noticed, the flower colours in my new border range from purple and blue to pale yellows – in studies it has been shown that bees love these colours best, detecting them through ultra violet rays. Butterflies love open flowers like those of the yarrow family. Achillea ‘Summer Shades’ is a good long-flowering one; I’ve added this and have moved a patch of the white daisy-like flowers Leucanthemum as these are also a great favourite. 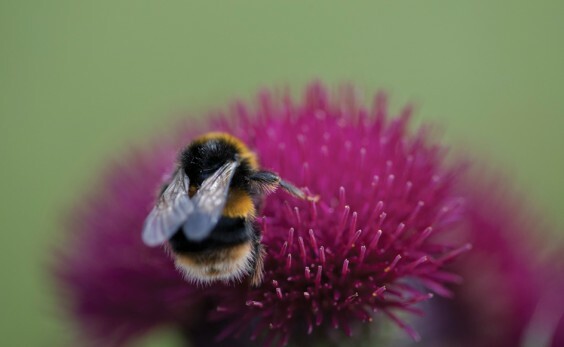 The variety Superbum will flower from June right through to September, and this is the last remaining factor – make sure you carry the nectar provision right through to late summer and early autumn with perennials that will provide that last feed of nectar before the winter sets in. Obvious choices for both bees and butterflies wanting to feed in the autumn are the Sedums with their flat heads and easy-to-reach flowers, Echinacea and all the varieties of Aster, particularly the blue-flowered ones. I’m keeping a record of how this border progresses and what insect visitors I have this year – the added bonus is it should look stunning too. For more information, visit http://www.bumblebeeconservation.org/gardening or http://www.butterfly-conservation.org and go to “How to help: gardening”.